Fall may very well be in the air, but the only season that matters right now in fashion is Spring. For the last three weeks or so, designers have been sending their Spring 2011 collections down the runway. I've spent the greater part of this week scanning through them on style.com. 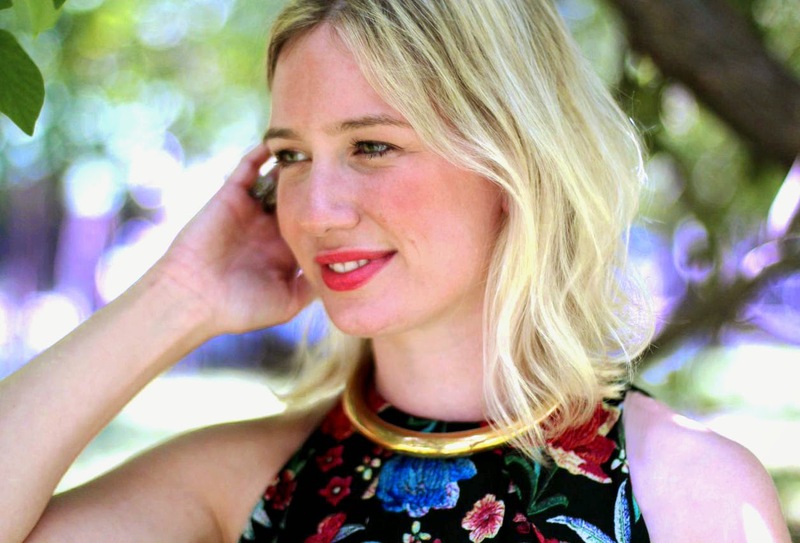 For those of you who have ever worked in the industry, you already know the torture of selling and promoting beautiful garments that won't become accessible to you for almost another year. That was pretty much the story of my life when I worked for Canadian women's wear designer Lida Baday. Fortunately, I can turn my lust into art which proves to be much more productive. 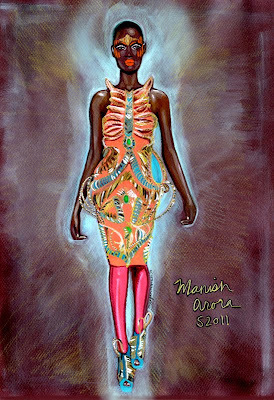 This post is dedicated to my favorite look from the Spring 2011 collections by designer Manish Arora. I absolutely loved his saturated fruity-color palette and "futuristic baroque" designs. The Mumbai-born designer clearly let his heritage shine through the lavishly crafted garments. Now if only I could manage to both visit India and purchase one of these garments, I think I would be on cloud 9, or rather cloud 11!! Speaking of clouds, doesn't my drawing sort of resemble one? I'm interested to get more feedback from my readers. What does everyone think about my interpretation of the look? Good, bad, or ugly, I would love to hear your thoughts. 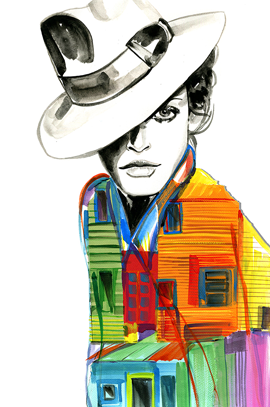 By the way, I entered this piece into Jane's Sea of Shoes Spring Fashion Art Contest!! You can view the gallery of entries by clicking on the link. Thanks again Jane for the amazing opportunity. Is it only me? Or do I like your drawing more than the 'original.' lol. 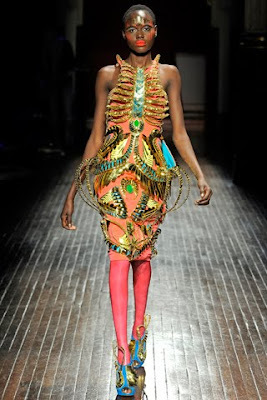 I must say; your Interpretation of designer Manish Arora's model on a runway, is more than simply spring fashion. 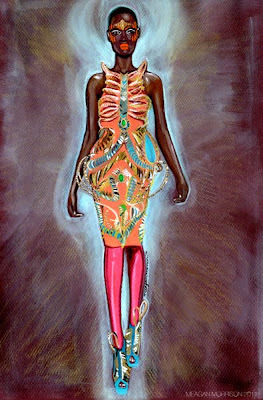 We're talking about art & fashion, it is hard to categorize. Your portrait is so accurate. You can’t stop there. Something else must be buzzing on your horizon. I look forward to viewing more of your works when posted. Wow, Impressive girl! Great drawing! Great illustration! I love it! Please interpret more looks from collections. This is so beautiful. Thanks Dunk, I will as soon as school projects slowdown. Come back soon! !